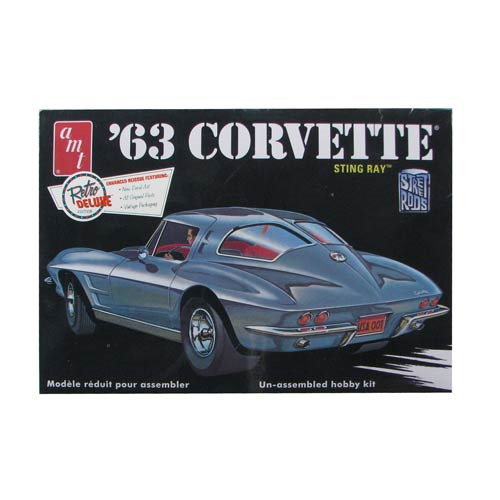 From AMT comes the 1963 Chevy Corvette Sting Ray 1:25 Scale Model Kit. Featuring the distinct Corvette Sting Ray, this 3-in-1 kit comes with alternate parts allowing you to build factory-stock, street-custom, or drag-greaser variants! This kit comes worth pre-lettered drag slicks, and has multiple engine intake options, clear red taillights, stock, and custom wheels, and decals. Any classic car buff will appreciate this kit. Skill level 2, requires paint, and glue to construct (sold separately).